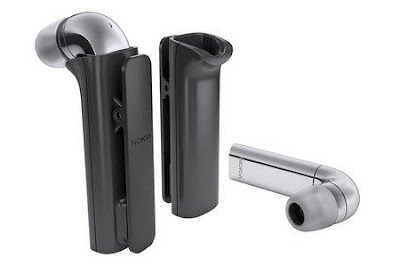 With dedicated players like Jabra and Plantronics making their mark in the Bluetooth headset segment, does Nokia's latest premium headset, the Nokia J, stand a chance? Priced slightly higher than average, does the Nokia J justify its cost? Pairing the Bluetooth headset with a Nokia C5 was the easiest thing. The headset was intuitive enough to know when we were trying to pair it and gave us precise instructions during the set up. The set-up would be a complete no-hassle affair even for a first-time user. We made calls from inside our workplace and while on the road, and the Nokia J remained crystal clear in both situations. The headset comes with built-in DSP noise cancellation technology which contributed well to the cause. Those who don't adapt to most in-ear cups too well, might not have too much trouble sporting the Nokia J. The angular earphone was a decent fit and the body itself light enough (at just 8 grams) to be worn for a long period of time without much inconvenience. Apart from the performance, the Nokia J scores pretty high on design and build quality as well. Made with stainless steel, the earphone looks classy – something you'd imagine the likes of business head honchos walking around with. The body with a slim form factor (47.4 x 12.5 x 6.4 mm) houses a multifunction key with a touch sensitive area which you can use to receive and end calls or power the headset on and off. The Nokia J lets you use the headset within a maximum operating range of 10 meters. Accessories in the box include ear cushions in varying sizes, a docking clip and a micro SB connector to charge the headset. You might want to carry the clip around at all times because it houses the charging port for the headset. The holder also further simplifies the user experience with a variety of alternate operating options. For example, when the earpiece was lodged in the holder, we could answer a call just by picking it up without having to press the button to take the call. To end a call, we didn't have to press the button on the headset. Nokia J automatically disconnected the call when the earpiece was put back in the clip. The company claims the headset gives one up to five hours of talk time which is more or less the category average. 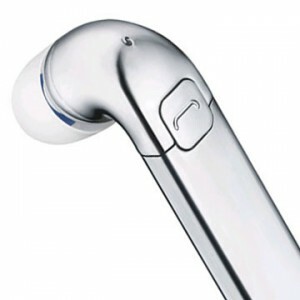 The Nokia J is one of the most intuitive and elegant-looking Bluetooth headsets in the market. The price is premium and the functionalities simple. The buy is justified for those who want to flash one of the best-looking earpieces in town with good call handling capabilities.